Set on the eve of the First World War, across oceans and continents, steamliners and cross-country trains, David Downing’s complex and thrilling new espionage novel takes us all the way back to the dawn of that most fascinating of 20th century characters—the spy. It is 1913, and those who follow the news closely can see the world is teetering on the brink of war. Jack McColl, a Scottish car salesman with an uncanny ear for languages, has always hoped to make a job for himself as a spy. As his sales calls take him from city to great city—Hong Kong to Shanghai to San Francisco to New York—he moonlights collecting intelligence for His Majesty's Secret Service, but British espionage is in its infancy and Jack has nothing but a shoestring budget and the very tenuous protection of a boss in far-away London. He knows, though, that a geopolitical catastrophe is brewing, and now is both the moment to prove himself and the moment his country needs him most. Unfortunately, this is also the moment he begins to realize what his aspiration might cost him. He understands his life is at stake when activities in China suddenly escalate from innocent data-gathering and casual strolls along German military concessions to arrest warrants and knife attacks. Meanwhile, a sharp, vivacious American suffragette journalist has wiled her way deep into his affections, and it is not long before he realizes that her Irish-American family might be embroiled in the Irish Republican movement Jack's bosses are fighting against. How can he choose between his country and the woman he loves? And would he even be able to make such a choice without losing both? David Downing grew up in suburban London. He is the author of One Man’s Flag, The Red Eagles, and six books in the John Russell espionage series set in WWII Berlin: Zoo Station, Silesian Station, Stettin Station, Potsdam Station, Lehrter Station, and Masaryk Station. He lives with his wife, an American acupuncturist, in Guildford, England. "[Downing] is a master at bringing the past to life through the careful and often loving observation of even minor players and through the artful deployment of specific detail. In addition, Jack McColl's debut has a zest, an exoticism and a joie de vivre well-suited to an era when best sellers were being written by Zane Grey, suffragettes were demanding the vote, and opium parlors were a readily accessible temptation." "Moves along briskly and offers interesting facts about events now a century past. It’s always entertaining." "When his “innocent” data-gathering escalates into knife fights and arrest warrants, McColl finds himself in an advanced game of espionage he hadn’t intended on playing. I can already see Gerard Butler in the lead role of the film version of this book." "Already had aficionados reaching for new adjectives to praise the author." "Downing, a fiendish researcher, does a believable job of inserting McColl into real life events, and the result is a novel marked by surprising adventures of an oddly amiable sort." "Downing seamlessly moves from Ian Flemming adventure to John le Carré politics across the broad canvas of a particular time period, never losing the intimacy with his characters." "As McColl travels the globe, Downing deftly depicts the complex prelude to World War I a web of unrest that connects German coal-hoarding in China, anti-imperialist protests in India, and labor strife in New Jersey, among other seemingly disparate tensions . . . It’s fun to watch the novice spy learn his craft." "Jack of Spies is lush with details about not only China and the U.S., but also England, Ireland, and even Mexico . . . with an urbane operative who is sure to be a hit with readers." "A powerhouse of a series debut . . . Think Raiders of the Lost Ark as told by John le Carré. The book is just damn fun." "As I was reading, I kept thinking this novel would be terrific theatre—Masterpiece, that is." "A nice introduction to Jack [McColl] and His Majesty’s Service." "A captivating, intelligent new World War I espionage tale by British author David Downing melds accurate historical detail with intricately crafted plotlines as it transports readers from China to San Francisco, Britain and beyond." "[McColl] is a winsome companion, which bodes well for the future of this new series. I, for one, am already eager for the next installment." "Just what we were waiting to read at the start of the summer." "Few other contemporary writers meld history and espionage quite like David Downing." "Some of the best and most involving espionage novels aren’t about super-spys, the James Bonds, but about ordinary people caught up in circumstances beyond their control. And that is what Downing does in Jack of Spies." "Highly recommended for readers of spy novels like John le Carré as well as fans of historical thrillers, like The Meaning of Night and The Alienist." "[A] master of the genre . . . Downing is capable of wringing more suspense out of a simple cat-and-mouse chase played out in a train yard than some of his better-known contemporaries can with a squadron of troubled covert-ops agents. That quality alone makes Downing and Jack of Spies a joy to read." "An attractive prospect for summer reading. More than that, however, it is a sound beginning for what looks to develop into an important series. Astute readers will want to be in at the start." 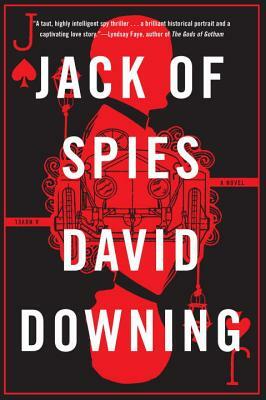 "Those who already know Downing's craft realize his deft hand with romantic passion and delicately portrayed merging of lust and love—and like the 'Station' series, Jack of Spies includes a serious affair of the heart." "Realistic espionage (for once! ), a deep feel for its period, an emphasis on the shock of the new that must have been felt at the development of world-shaking technology in the early twentieth century, a likeable and believable protagonist with enough of a personal life to ground him . . . I'm very much looking forward to the second installment." "The talented Downing is off and running once again." "This first installment of a proposed series moves deliberately but colorfully, with intelligent prose and a strong period feel." "Fans of Downing’s previous spy tales will not be disappointed with this excellent series launch that is full of rich historical and cultural details, revealed as his protagonist learns the espionage business on the eve of World War I." "It would already be enough that Jack of Spies is a taut, highly intelligent spy thriller without it being a brilliant historical portrait and a captivating love story to boot. A remarkably engaging world tour of pre-World War One espionage featuring an honorable protagonist begging for a long series." "Downing's outstanding evocation of the times (as masterly as that found in Alan Furst's novels or Philip Kerr's Bernie Gunther series), thematic complexity (as rich as that of John le Carré), and the wide assortment of fully rendered characters provide as much or more pleasure than the plot, where disparate threads are tied together in satisfying and unexpected ways."